Home / Batangas / BatangasCity / BatangasEssay / Lipa / When Lipa and Batangas Merge, Will It Become Metro Lipa or Metro Batangas? 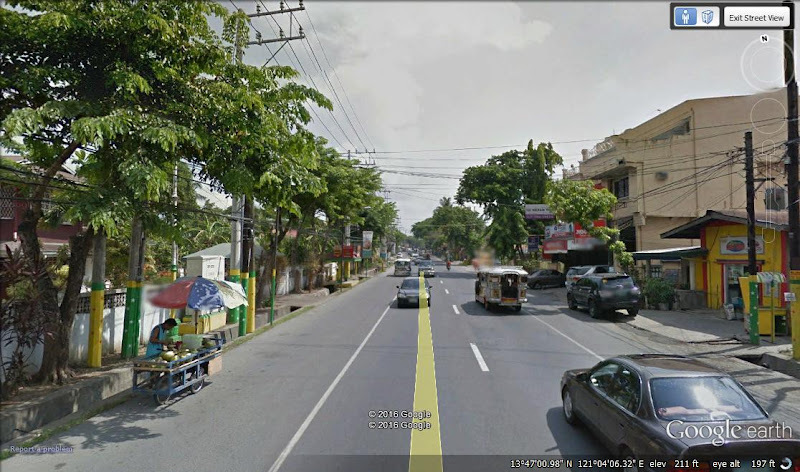 When Lipa and Batangas Merge, Will It Become Metro Lipa or Metro Batangas? Approaching Poblacion Batangas City. Image credit: Google Street View. Before you read any further, I wish to make it perfectly clear from the off that the notion is still strictly hypothetical. I have given the matter some thought over the years; and personally, I feel that the notion becoming reality is more a matter of when rather than if. I am old enough to remember when the cities of Manila, Pasay, Makati and Quezon were all distinct from one another and each city’s boundaries were still evident. My late father used to be an Air Force officer. Although he was based in Fernando Air Base here in Lipa City, back in the sixties it was not uncommon for him to make trips to Nichols Air Base – now known as Villamor. It was also not uncommon for me to accompany him and for us to make flying visits to Quezon City perhaps to the V. Luna Armed Forces Hospital or to see his cousin who lived in the city. Thus, I still carry inside my head memories – albeit hazy – of monotonous drives in Dad’s Air Force jeep along what he still referred to as Highway 54 – now known as EDSA – from Pasay City – where Nichols was – to Quezon City. I still remember when the geopolitical entities of Metro Manila were physically distinct from each other. Image credit: http://www.lougopal.com. As a young boy, I loved going to Manila because I was fascinated by the tall buildings and the colourful billboards. I say the drives were monotonous because while there were plenty of billboards in the cities, between Makati and Quezon City there were wide open spaces where there was nothing to see but grass fields. From Pasay to Quezon City took roughly 20 minutes; and to a young boy such as I was, that felt like an eternity. Besides, Dad’s Air Force jeep was not exactly limousine service. Now in those days, a trip from Lipa to Batangas City in those rickety old BLTB Company or United Bus Lines buses which ploughed the asphalt and gravel roads like there was no tomorrow took roughly the same time; i.e. about 20 minutes. By this time, you are likely starting to get my drift. Lipa to Batangas City once took roughly 20 minutes before the STAR. Image credit: Google Earth. By the time I first went to college in 1975, what used to be wide open spaces in what would become Metro Manila had started to fill out with structures. There were still vacant spaces, but these had become few and far between. In other words, the cities of Manila, Pasay, Makati and Quezon – along with the many municipalities in between – had started to become just this large mass of urban concrete. All it took was roughly a decade or so. In the present day, you just cannot distinguish between the cities and municipalities of what is better known as Metropolitan Manila. What used to be quite distinct geopolitical entities had, in a manner of speaking, just ‘volted’ in to become one large entity. Now consider this: from Nichols Air Base to the heart of Quezon City is roughly 17 kilometres as the crow flies. Now let us make allowances for how Highway 54 wound this way and that the way roads do and also for all the stop lights along the way. Let us therefore add a conservative 3 kilometres for an even 20 kilometres between Pasay and Quezon City. Meanwhile, the distance from the STAR toll gate in Tambo to the exit in Balagtas in Batangas City is – drum roll – roughly 17.12 kilometres. Suffice it to say that adding 3 kilometres to account for the curvature of the STAR will not be way off the mark. 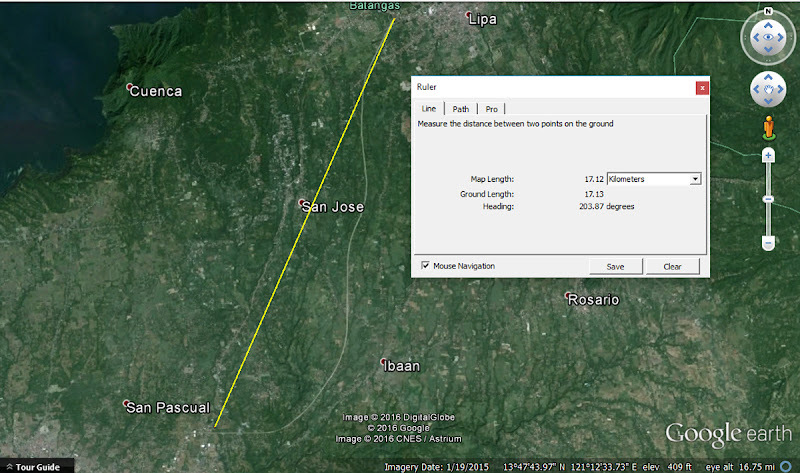 Google Earth's Ruler tool calculates distance between cities as the crow flies. Therefore, the distance between Pasay and Quezon City along what used to be Highway 54 is almost the same as that between Lipa and Batangas City along the STAR. Of course, one sees nothing but agrarian lands along the STAR. 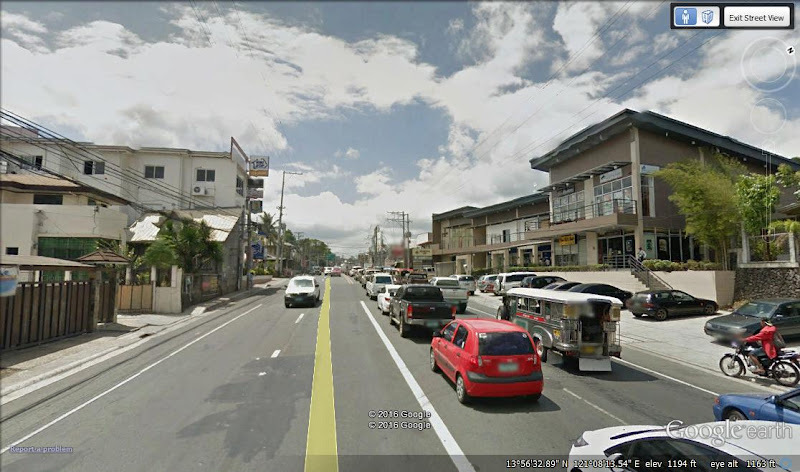 However, that both Batangas City and Lipa are growing outwards is more evident along the J.P. Laurel National Highway. 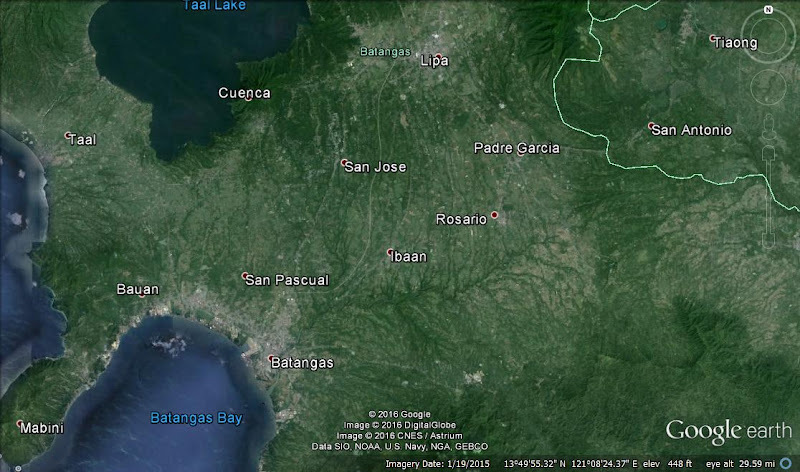 At the turn of the millennium, Alangilan in Batangas City and Tambo in Lipa were still relatively quiet back roads. Look at what both have become in the present day. In fact, economic development has started to grow beyond both barangays. The growth of Metro Manila into this one humongous urban centre, naturally, was due in no small way to the place being the centre of business and enterprise in this country. That is why the pace of development has always been so much faster. Batangas City is growing outwards. The Google Street View picture above shows Alangilan. Ditto Lipa City. Above, Barangay Tambo. Image Credit: Google Street View. That this development has started to spill over to Batangas does not even need further discussion. It is there for all to see. It is also evident in the provinces of Laguna and Cavite. Government policies on preserving agricultural lands will eventually dictate whether Batangas City and Lipa ‘volt in’ to become as one. Ditto the willingness or reluctance of landowners to sell property to developers. However, that Batangas City and Lipa will eventually become one large metropolis does not seem far-fetched at all now, does it? The question always is when it will happen. 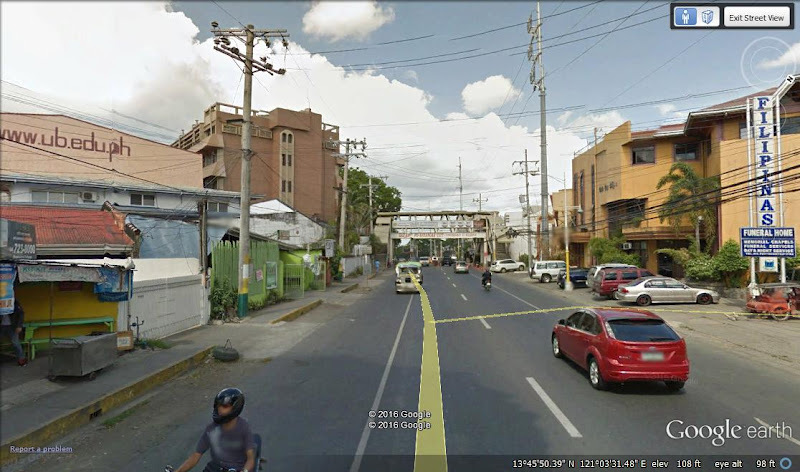 So now to ask the question again: will the metropolis be Metro Batangas or Metro Lipa?